BJP member Bhupendra Yadav moved the motion under Rule 187, against Mr Gandhi and urged the Chair to take notice of the alleged breach of Mr Jaitley's privilege, who is also the leader of the House. 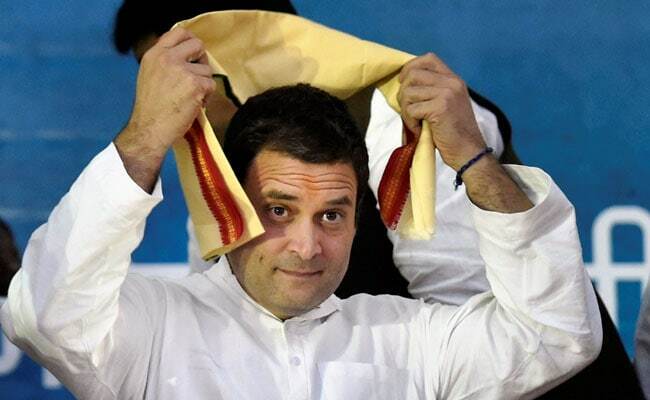 New Delhi: The Bharatiya Janata Party (BJP) on Thursday moved a privilege motion in the Rajya Sabha against Congress President Rahul Gandhi for "mocking" Finance Minister Arun Jaitley by "twisting" his name. "The members of this House have dignity. The name of Leader of the House Arun Jaitley has been intentionally published by the Congress President with malafide intentions to defame this House," Mr Yadav told the Chair. "The way his (Jaitley's) name has been twisted by the Congress President on his Twitter handle, it comes in the category of (breach of) privilege. There are precedents such as that of NC Chatterjee in 1954. I request you to go to this precedent and issue notice to Rahul Gandhi," he added. Referring to a statement given by Mr Jaitley in the House on Wednesday, Rahul Gandhi had tweeted: "Dear Mr Jaitlie (sic) - thank you for reminding India that our PM never means what he says or says what he means." Mr Jaitley on Wednesday made a statement in the House clarifying Prime Minister Narendra Modi's position vis-a-vis his "conspiring with Pakistan" comments against his predecessor Manmohan Singh in order to end an impasse. "The statement (by Modi) did not question nor did he mean to question the commitment to the nation of Manmohan Singh or Hamid Ansari, the former vice president. Any such perception is completely erroneous. We hold these leaders in high esteem as also their commitment to the nation," Mr Jaitley had said. The finance minister made the statement as part of an understanding with the Congress party over the issue, that had led to stalling of the Rajya Sabha and disruptions in Lok Sabha for several days with the party demanding an apology or explanation from PM Modi. The Congress also reciprocated by disapproving Mani Shankar Aiyar's criticism of the prime minister after which the House resumed normal business.